This past summer, the Boettcher Foundation launched a “collaboration grant” program that paired 12 Boettcher Scholars with Boettcher Investigators at Colorado institutions. The students had the opportunity to assist with research, while the Boettcher Investigators benefitted from having highly skilled and dedicated students in their labs. 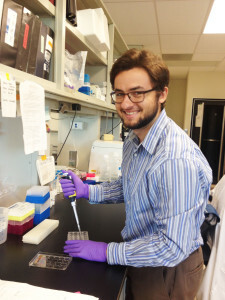 For 2011 scholar Lucas Suazo, a student at Colorado State University, it meant studying damaged lung cells and shadowing patient visits with Dr. Rachel Zemans at National Jewish Health. 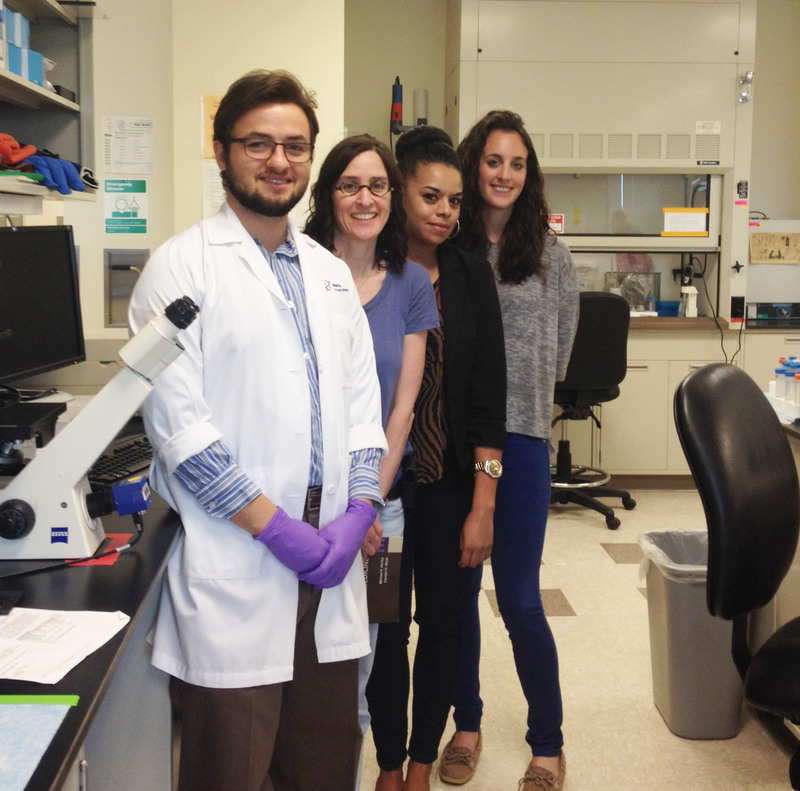 Lucas Suazo in the lab at National Jewish Health. Lucas Suazo with Rachel Zemans and her team. Lucas also joined Rachel on clinic visits and helped her review x-rays, CAT scans and breathing tests results. Not only did he learn how to examine patients, but with Rachel’s help, he set up an entirely new technique for testing lung cells. For Rachel, the collaboration grant was a unique way to pass on her enthusiasm for the field of research. For Lucas, it was both an opportunity to transfer his classroom learnings into a real lab setting, as well as develop a relationship with a great mentor. Meanwhile, 2014 scholar Maddie Walden collaborated with Boettcher Investigator and Boettcher Scholar alum Amy Dounay at Colorado College. 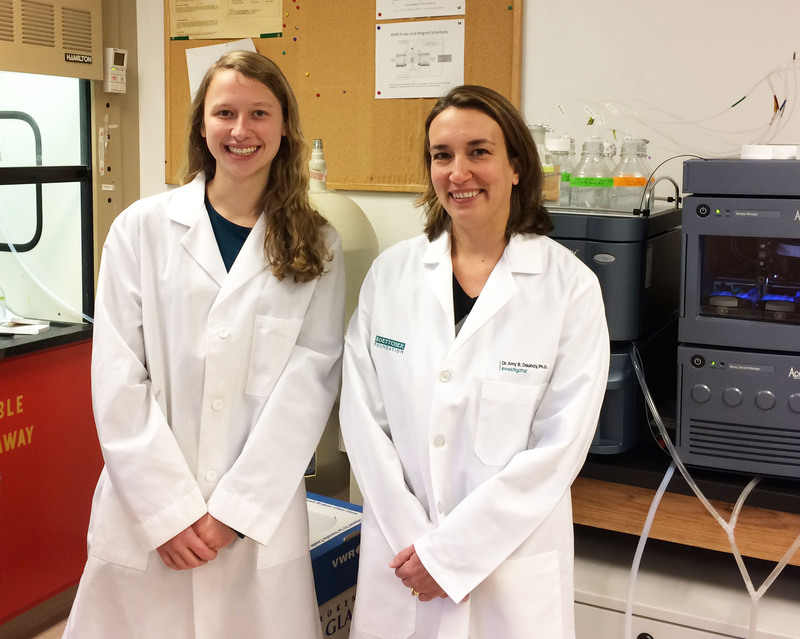 Together, they worked on synthesizing new drug compounds that will hopefully treat African Sleeping Sickness. Because of her chemistry background, Amy was excited to invite CC chemistry major, Maddie, into her lab. Maddie Walden and Amy Dounay. “She’s very enthusiastic and skilled. Boettcher has already vetted these students as being ambitious, hardworking and having a lot of potential, and that was definitely reflected in Maddie,” Amy said.